Please refer to our stock # T1829 when inquiring. 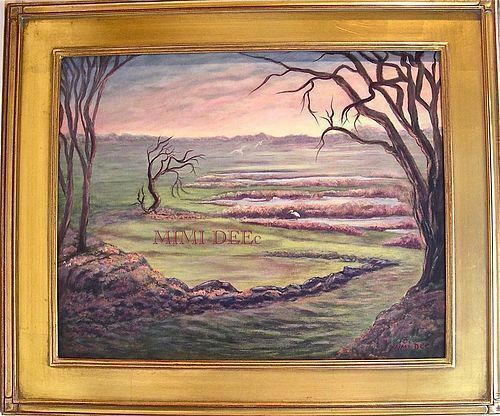 The latest original regional Cape Ann marsh painting by this painter. A peaceful serene marsh scene depicting stark trees with the appearance of multi color leaves at their base. Look to the trunks and limbs to find the sky colors there too. The rock lined path takes you to the mid ground where you will find one white heron eying its meal in the marsh waters and two other birds in flight. What this artist relishes painting is a distant luminous sky...sometimes subtle...sometimes more pronounced... in buttery yellow with gentle rosy peach and blue soft rolling clouds. All that and the greens, rosy amber grasses at mid ground along with the lavender trees at the horizon are all painted with a very challenging limited palette of just 3 pigments plus white! Canvas laid on professional archival Amersand museum hard board panel. Title: "Marsh Moment" - ID # 0803161013 - No reproductions! Sight: 16 X 20" - please try to ignore the shadow at the top of the painting cast by the frame's edge. It is not present in person! Frame: 21 3/8" X 25 3/8" - Professional closed corner gold leaf gallery frame. Particulars: A very limited palette of three pigments plus white resulting in neutral hues for your neutral tastes or for those who just love to look at marsh paintings. Please call for shipping info. Shipping without frame saves money. Save money and have it mailed without the frame. Original work by this self taught artist who also forges sterling silver metal work studio jewelry, has been exhibited in various area artist association shows since 1998 and at the previously open Methuen studio store gallery by the same name. Note on gold leaf frames. Not all golden colored frames are of the aforementioned variety. The professional ones, as seen above, are closed cornered (no mitered lines at corners) and often show overlap lines where the leafing is hand applied. EXHIBIT HISTORY: Aug - Sept 2016 at North Shore Arts Association... a 501 (c) 3 non profit charitable organization, promoting and preserving the fine arts since 1922. If you saw this there, please advice as a percentage would go to NSARTS for the building restoration fund raising project.